In 2018, 85% of Google’s revenues came from advertising. Those revenues represented over $116 billion. 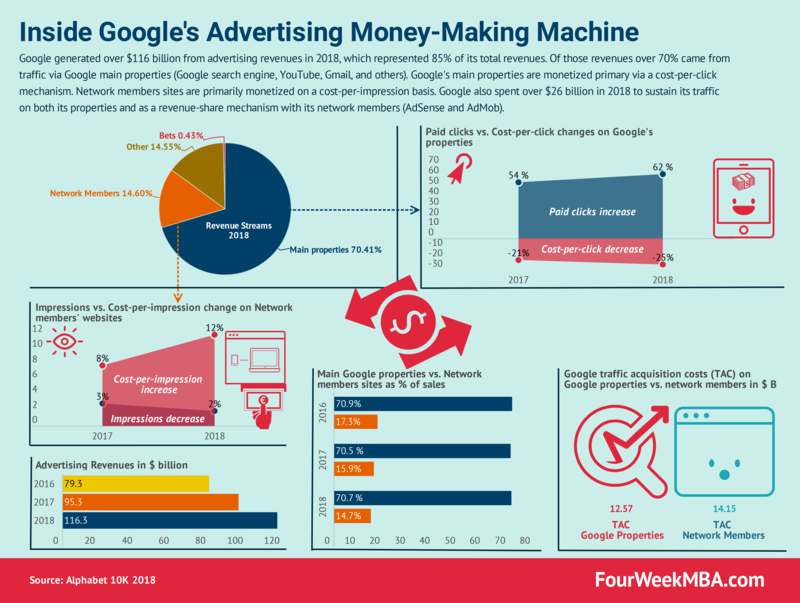 Thus, understanding Google’s powerful advertising money-making machine is critical to understand Google (now Alphabet) current business engine. In a media business (yes Google is a media company as of 2019) those two elements are critical to building a business that makes sense. This might seem trivial also for starters. Yet, in a large organization like Google, which has built an empire on its advertising machine, understanding its dynamic can make you understand how a whole industry (that of digital media) works. Indeed, if you have a website, you have two issues. First, you need to bring qualified traffic to it. Second, you need to be able to monetize that traffic at a higher rate compared to its costs. For that matter, you’re a “traffic arbitrageur” as you make money on the difference or delta between the price to acquire traffic and the revenues in selling that traffic back. Each of those traffic sources gets monetized differently. Indeed, the traffic coming from distributions and partnerships agreements get driven to Google’s main pages, to be monetized with its paid advertising machine, called Google Ads. Not all traffic that goes through Google gets monetized directly, as a good chunk of it consists of traffic that goes through websites that rank organically on it. Some of those sites that rank organically on Google are part of its network, so they sell impressions on banners placed by Google on their sites. For instance, in 2018 the cost-per-click for business advertising on Google decreased by 25% according to Google’s annual report for 2018. However, the business continued to grow substantially as more paid clicks were placed on Google. In short, it seems Google is becoming more polarized. On the one hand, Google offers paid listings, that are taking more and more space, especially on mobile devices. On the other side, Google is eating up organic traffic by offering direct answers to its users. This should not be a surprise. Indeed, Google’s mission “to organize the world’s information and make it universally accessible and useful” is also its North Star. Google network members traffic comprise traffic coming from members part of AdMob, AdSense and Google Ad Manager. In 2018 Google Network Members’ revenues increased by $2.4 billion from 2017. The growth was primarily driven by strength in AdMob and programmatic advertising buying. Instead, Google AdSense revenues declined. Additionally, the growth was favorably affected by the general weakening of the U.S. dollar compared to certain foreign currencies. TAC stands for traffic acquisition cost, and that is the rate to which Google has to spend resources on the percentage of its revenues to acquire traffic. Indeed, the TAC Rate shows Google percentage of revenues spent toward acquiring traffic toward its pages, and it points out the traffic Google acquires from its network members. In 2017 Google recorded a TAC rate on Network Members of 71.9% while the Google Properties TAX Rate was 11.6%. In 2018, Google traffic acquisition costs (TAC) increased substantially due to changes in partner agreements. Also, the swift change toward mobile also resulted in higher TAC because on mobile users are channeled through paid access points more frequently. This, of course, is good for Google which makes way more money from mobile, but it also increases its traffic costs. Also, browsers (are still an essential mobile access point) will want more money from Google to close exclusive deals with them. Instead, when it comes to the increase in the Network Members TAC rate, this is happening through the fact that more and more publishers part of the AdSense network is switching to programmatic advertising to manage more efficiently their advertising inventory. Caveat: a weakening U.S. dollar in 2018 played in favor of Google‘s advertising revenues coming from the outside the US. That has affected Google‘s overall advertising revenues. What’s going on with Google advertising business?